With the development of information technology, more and more audio formats can be used for our choice. For example,WAV., APE.，AAC. , MP3. and FLAC. are the mainstream of lossless audio files on the market. First, we will start with FLAC. audio format. The full name of FLAC is Free Lossless Audio Codec. FLAC. is a famous free audio compression coding, which is characterized by lossless compression. Unlike other lossy compression codes, such as MP3 an,d AAC, it doesn’t break any of the original audio information, so it can restore the music disc quality. Compared to other lossless formats,For example, Monkey’s Audio and Shorten, FLAC support more platforms and hardware products, and the compression ratio of FLAC is higher. And it’s one of the best ways to save a music CD on a computer, because it doesn’t damage the original audio data and retains the original tone.This is why FLAC. needs to be converted into the form of a disk. Nowadays, FLAC became one of the most popular lossless compression formats for merchants and the public. Thus, here comes the question: is there any existing FLAC to DVD creators that can support to import FLAC audio easily？The contents below presents effective solutions. This kind of software is relatively rare on the market but fortunately we can still find a good one. ——Freemake Video Converter. Freemake Video Converter converts video between 500+ formats and gadgets free! Convert to MP4, MP3, AVI, WMV, MKV, iPhone, Android. Convert FLAC. to DVD. . Absolutely free. No trials or limitations. If you like this, you can try to download it. Leawo Video Converter——The best video file converter for you to convert videos and audios between all popular formats like AVI, MP4, MOV, MP3, AAC, FLAC, etc. Superior to other free video converters. 2D to 3D conversion feature enables you to create 3D movies for vivid video enjoyment. This all-in-one video converter software offers powerful editing features to add special effects, watermarks, etc. Setting parameters of output profile is feasible as well within this video converter software. Converting video and audio files for multiple portable devices, phones, tablets, PCs, websites and more. With user-friendly interface and super-fast conversion, you make video and audio conversion easy and fast. Leawo DVD Creator is equipped with the ability to convert video to DVD. It supports more than 180 formats. Videos in formats like AVI, MKV, MP4, WMV, Xvid, MOV, and FLV can be burnt to DVD-9 and DVD-5 discs. 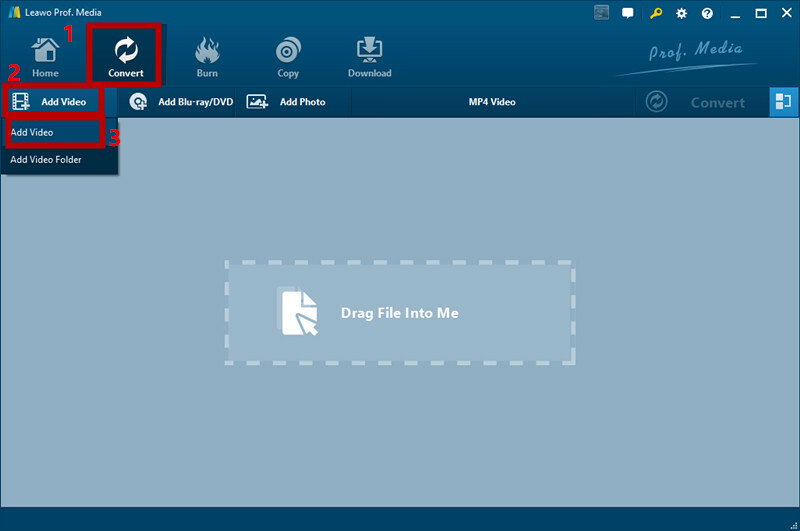 With it you can easily create DVD from all kinds of videos like homemade videos or movie clips. 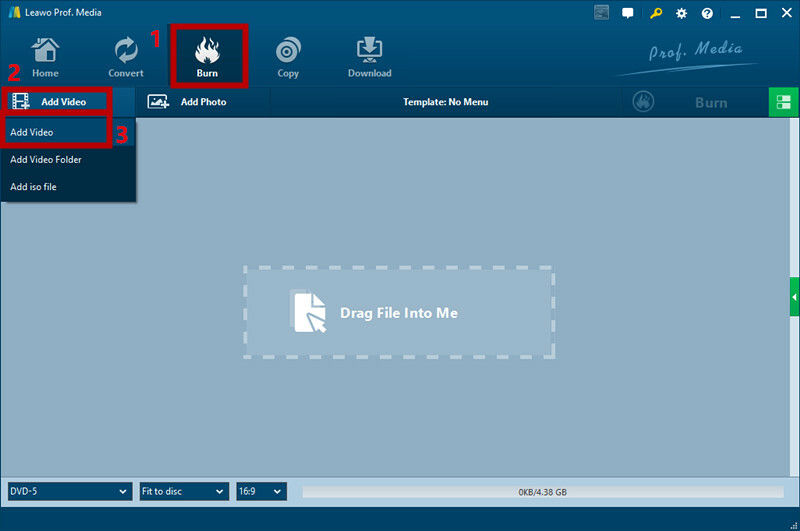 The built-in photo slideshow maker allows you to create photo slideshow videos and burn them to DVD. 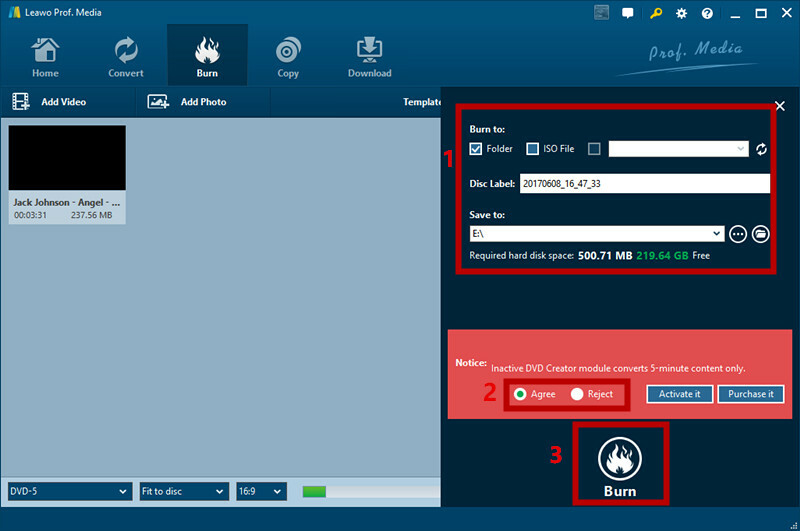 The tutorial below will show you exactly how to burn FLAC to DVD in detailed steps. Step 1: Launch Leawo DVD Creator which included in Leawo Prof. Media Software. 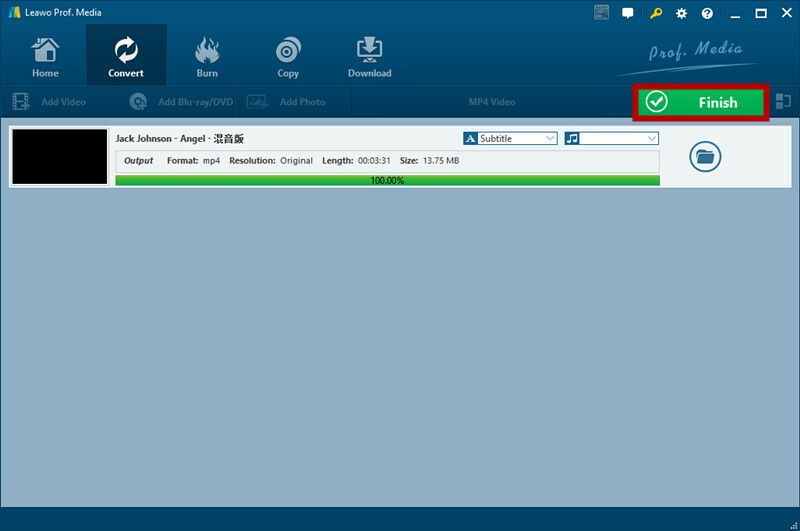 Step 2: Click “Convert”, then click “Add video” and choose “Add Video File”. Step 3: Select storage path. First click “Agree” and then click “Convert”. Step 4: Click “Finish” and continue to burn MP4 to DVD. There are also some other tools that can achieve the goal, for example Nero Burning ROM11 – this is a first-class recordable and superelevation ultra – high quality CD, DVD and optical disc – ray disc with advanced security options. This software allows you to create and share photos, music and videos in an unprecedented way. 360 – degree full – range experience is designed to improve your digital lifestyle. However, it’s not easy to download. As one of the few FLAC to DVD burners on the market and with a lot of great editing features, Leawo should be considered. For example, rich video editing features like Trim, Crop, Effect and Watermark make your output more colorful and vivid. Flexible 3D setting modes allows you to enjoy 3D video by using kinds of 3D glasses and 3D Depth effect setting ensures awesome 3D display effect. Output video and audio parameters also can be set. Besides, video preview, batch processing and fast operating speed drive you to get your required file format as soon as possible.